Rosetta Christine Rena Schlange, 98, of Auburn, Nebraska was born on April 7, 1920, in Nemaha County, Nebraska to Sigmund and Lena (Plager) Stutheit. She grew up on the family farm south of Johnson and attended Greenfield District #62 country school. On November 28, 1940, Rosetta was united in marriage to Elmer Schlange at the St. Paul (Stutheit) Lutheran Church south of Johnson. To this union two children, Gary and Marilyn, were born. Rosetta lived her entire married life on a farm west of Auburn where she was a homemaker. 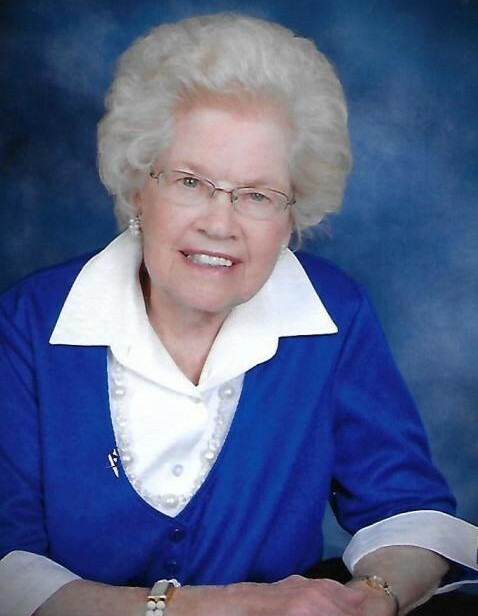 Rosetta was a member of St. Paul Lutheran Church in Auburn, the Dorcas Circle, and the Auburn Eagles Club. She enjoyed cooking, baking, sewing, quilting, gardening, and loved spending time with her children and grandchildren. Rosetta passed away on Thursday, September 27, 2018, at the Good Samaritan Nursing Home in Auburn, Nebraska having reached the earthly age of ninety-eight years, five months, and twenty days. She was preceded in death by her parents, husband Elmer, brothers Werner and Edgar (Ruth) Stutheit, sisters Leona (Raymond) Hutton and Vernita (Eugene) Johnson, and an infant twin sister Roseola Stutheit. Rosetta is survived by her loving children Gary Schlange and wife Mary of Auburn, NE; Marilyn Larson of Tallahassee, FL; grandchildren: Kevin Schlange and wife Teresa of Auburn, NE; Kim Hahn and husband Terry of Johnson, NE; Thad Larson and wife Martha of Tallahassee, FL; great-grandchildren: Abriel, Alyson, and Allan Schlange, Kacie, Ty, and Jayden Hahn and Seth Larson; and many nieces, nephews, relatives and friends. Funeral Services will be held 11:00 a.m. on Monday, October 1, 2018, at the St. Paul Lutheran Church in Auburn, Nebraska with Pastor Ken Miller officiating. Visitation will be held from noon-8 p.m. on Sunday, September 30, 2018, at The Hall Funeral Chapel in Auburn. Family will greet friends from 1-3 p.m.
Memorial contributions may be given to the family’s choice which will be designated by the family at a later date.